King Harald and Queen Sonja experienced an unusual end to their six-day state visit to Chile over the weekend, when they were suddenly surrounded by angry demonstrators in the southern city of Punta Arenas. The royal couple took it in stride, with the monarch even claiming that it was a good example of Chile’s hard-won democracy. At issue was the entry and looming expansion of Norwegian-owned fish-farming operations (aquaculture) along the coast of Chile. More than 60 Norwegian companies are already established in Chile and the royals were meant to be opening doors for more. Around 70 representatives from Norwegian businesses were along on the state visit. Demonstrators’ signs, however, read that the Norwegian king was welcome “but not your salmon.” Fish-farming is viewed as an industry that can pollute local waters and spread disease in the fjords, which in turn poses a threat to wild salmon. The protests were aimed at bringing more international attention to the conflict over the salmon industry that also has raged off the coasts of Canada and Alaska and not least in Norway. King Harald himself is eager to fish for wild salmon in Norwegian rivers every June, but the country’s constitutional monarchy restricts him from stating political positions on the issue. The royals had also been met by protestors in Santiago, but those in both Punta Arenas and Puerto Williams were much more aggressive. Demonstrators surrounded them while they were walking through the central square of Punta Arenas, just after a welcome ceremony that featured national anthems and traditional song and dance. Queen Sonja stopped to speak with the demonstrators as did King Harald. The couple was escorted by both civilian and military security personnel, and they were not viewed as being in any danger, but the demonstrators managed to come face-to-face with the royals and make their message clear. “We think it’s important that they’re heard,” the queen told NRK. “We wanted to show that we will gladly listen, and together we can perhaps find a good solution if they believe they have problems.” Because of the political aspects of the salmon-farming conflict, it was left to the Norwegian government’s ambassador to Chile, Beate Stirø, to respond to the demonstrators there and then. After a short conversation between her and the demonstrators, with the royals standing by her side, they were then escorted to the local City Hall where they were received by the mayor. More protests awaited on Sunday, when the royals’ motorcade was halted by demonstrators who had blocked the road in the scenic area. Several of the flag-waving demonstrators banged the royals’ car with both their flag poles and their fists, while shouting protests against the Norwegian salmon industry. The press bus was also pummeled by the demonstrators. NRK reported that around 40-50 demonstrators also confronted the royal couple when they visited a sailing school, breaking through barriers set up to keep them at a distance. The director of a local museum who was supposed to guide the royals around it also reportedly had been fired just a few days earlier because he had demonstrated against the salmon industry himself. He told Norwegian news bureau NTB that he had been “incredibly surprised” by his dismissal. 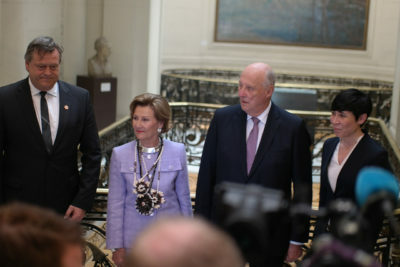 Video taken by NRK shows how King Harald and Queen Sonja ultimately accepted a written statement from representatives of the demonstrators and they all shook hands. Norway’s government minister in charges of the fishing and seafood industry, Harald T Nesvik of the conservative Progress Party, was along on the trip to Chile and he acknowledged the “challenges” posed by sea lice and farmed fish that escape from their enclosures. He insisted that Norwegian officials and companies must respect all local laws and regulations. He claimed that new systems in Norway can provide more predictability while also protecting the environment, and that officials in Chile are “are very interested in our experience with farming at sea. Chile and Norway can make important contributions to the world’s seafood production,” while also fighting illegal fishing and any lack of regulation.